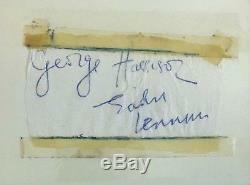 Here we have a paper serviette signed in blue biro by John Lennon & George Harrison. This was signed for a waitress when the Beatles stopped on the M1 motorway services at Newport Pagnell sometime in 1964. To protect it, It has been taped to a card. The paper measures approx 5" X 3" and is in very good- condition. Also be sure to check out all our other great auctions! The item "1964 AUTOGRAPHS OF JOHN LENNON & GEORGE HARRISON SIGNED ON SERVIETTE BEATLES" is in sale since Monday, December 17, 2018. This item is in the category "Music\Music Memorabilia\Artists/ Groups\The Beatles". The seller is "beatleworld" and is located in London. This item can be shipped worldwide.